Set in the grounds of an ancient earth temple where Ming and Qing rulers performed sacrifices to the God of Earth, the Ditan Temple Fair is one of the largest and most popular temple fairs in Beijing. The fair features lots of dances, food and markets but one of the biggest highlights is a re-enactment of the ancient sacrificial ritual which is bright, colourful and unforgettable. 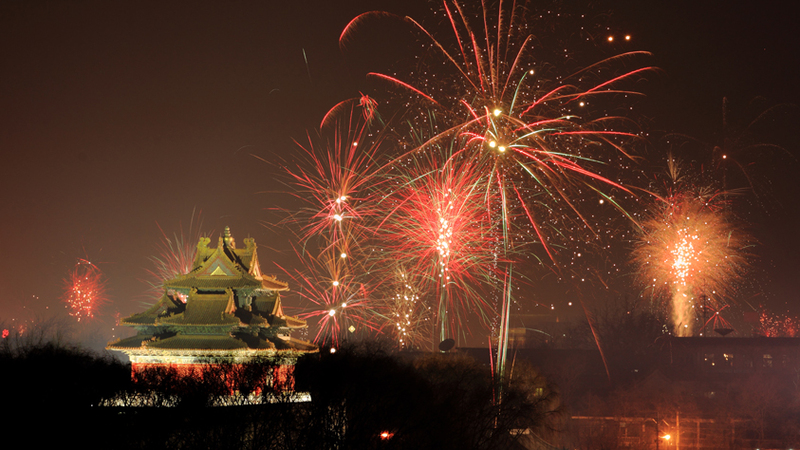 While the government of China is increasingly discouraging of the use of fireworks and pyrotechnics in Beijing due to the city’s high levels of pollution, on New Year’s Eve you’re sure to catch plenty of displays over the city. As the capital city of the country that invented fireworks, the people of Beijing take pride in their ability to craft unique and memorable displays leading to some truly incredible sights. The displays also serve a traditional purpose as the lights and sounds are said to ward off nefarious spirits. An alternative to the many temple fairs around the city, Longtan Fair is a sporting event where both professional athletes and members of the public can compete against one and other. Martial arts champions demonstrate their skills in front of huge crowds and hundreds, if not thousands, compete in massive table tennis, arm-wrestling, chess and rock-climbing contests as well as much more. There’s also plenty of snacks and souvenirs to be found in and around the fair. Located about 50 miles from the centre of Beijing with daily buses to and from the city, Longqing Gorge Ice and Snow Festival is a separate event to Chinese New Year that is planned to coincide with the festivities. The Ice and Snow Festival involves lots of winter sports exhibitions as well as a spectacular series of ice sculptures and snow art. This is a great day out, perfect for breaking up a visit to the city for the holiday. For ideas about how to celebrate Chinese New Year while travelling through Manchester Airport click here and, on behalf of Manchester Airport, we’d like to wish you an incredible New Year filled with good fortune.